Inspired more than thirty years ago by works as diverse as J R R Tolkien’s The Lord of the Rings and the ‘spaghetti westerns’ of that time, the Dark Tower series is the backbone of Stephen King’s legendary career. Eight books make up this bestselling fantasy series. 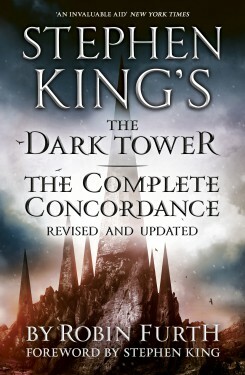 THE DARK TOWER: THE COMPLETE CONCORDANCE is the definitive encyclopaedic reference book that will make navigating through the series an even more enjoyable reading experience for readers. With hundreds of characters, Mid-World geography, High Speech lexicon, and extensive cross-references, this comprehensive handbook is essential for any Dark Tower fan. This updated volume is an invaluable guide to all of Mid-World and one of Stephen King’s most significant literary achievements.